Art Talk: Helmar and May Arts Blog Hop!!! Come Hop with us! Helmar and May Arts Blog Hop!!! Come Hop with us! Our team has been excited about this hop. We love playing with ribbon and May Arts always has gorgeous ribbon for us to play with. What is even more fun is that Helmar and May Arts are giving away TWO chances to win some great product on this TWO day Hop! 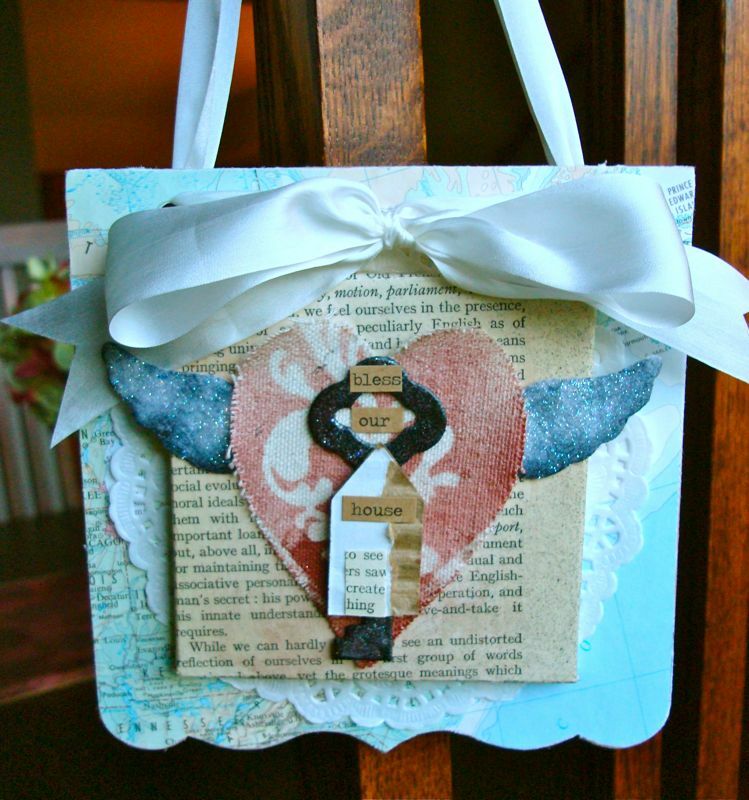 Helmar will be offering two Arts & Crafts Starter packs! 1st winner will be selected 11/21. Second winner will be selected after Thanksgiving weekend. May Arts will be offering two prize packages of winner’s choice of 2 spools of ribbon! So, how do you enter to win a chance at one of these grand prizes? Hop through with us and visit each designer’s blog and leave a comment on their Helmar and May Arts Blog Hop post. The first winners will be chosen on the 21st and the second winners will be chosen after the Thanksgiving Holiday weekend! So let’s get started! 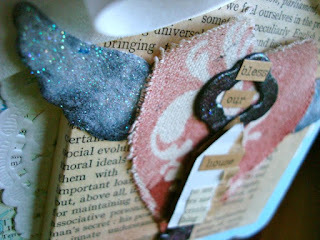 Here is my project using Helmar Adhesives and May Arts ribbon! I made a wall hanging using Basically Bare canvas, felt and chipboard, book paper, Faber-Castell Design Memory Craft products, May Arts silk ribbon and Helmar Craft & Hobby PVA glue and 450 Quick Dry Adhesive. I covered the chipboard page with map paper using the Helmar Craft Glue, added a doily and then covered a mini canvas with book paper also using the Craft Glue. I glued the canvas down with the 450 Quick Dry adhesive. The wings and canvas were colored with Faber-Castell Gelatos. I glued the fabric and felt down with the 450 Quick Dry adhesive. I added the silk May Arts ribbon as the hanger here. The silk is beautiful and makes gorgeous bows! I hope you enjoyed my little project and will follow along with the blog hop for a chance at winning one of those awesome prizes! Very nice! I love the mix of textures and you always use layers and inks so well. Gorgeous!! I love the papers you used. Thanks for the inspiration! Great wall hanging! Loving all the textures. That is so beautiful. First thing I though was, OMGosh that is a very feminine version of Bon Jovi's logo! So pretty! Thank you for the inspiration! 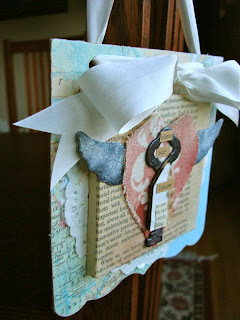 Love your wall hanging project and the glittered wings looks great. Fab wall hanging - great colours, layers and textures!!! jen, great wall hanging, nice feature of all the products. I am learning about so many new products doing this bloghop. Great projects by everyone too. How pretty and delicate! love the doily! love the layers on this! So pretty and looks easy enough to actually do! Thanks for sharing how to and what you used. I hope to win some of that lovely May Arts Ribbon to play with too! Have a wonderful Thanksgiving! So delicate and pretty! Love the satin ribbon! Helmar makes some seriously incredible glue to be able to stick together such a variety of media! This is super cute! Lovely altered wall hanging. So much beautiful texture. Thanks so much for sharing.